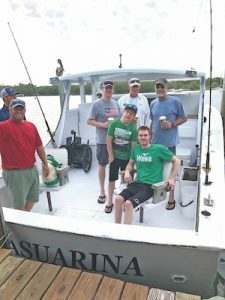 BY SUE ERWIN – Purdue University graduate student Wesley Major came to visit Boca Grande for the first time in April. His aunt and uncle, Jerry and Carol Rainey, have a home on Tarpon Street. After getting a tour of the town, the family spent the weekend tarpon fishing with Capt. Charlie Coleman. Although no tarpon were caught, they did catch a few small groupers. But the experience was special for several reasons. When Major was 20-years-old, he was involved in a very serious motorcycle accident. The young man learned to use a wheelchair for future mobility. “This was my first time back on a boat and swimming in the ocean since my accident … so it was a successful trip,” Major said. During rehabilitation, he met a mentor who spoke with him about a program that helped people with disabilities of all ages learn to fly. Able Flight is a program created by pilots who believe that the life-changing experience of learning to fly is best shared, and designed the Able Flight Scholarships to enable people with disabilities to pursue that experience. The program is a seven-week long, intensive summer course that takes place at Purdue University in Indiana. “I had never thought about flying before, but after he told me about the school, I decided to look into it,” Major said. Individuals selected do not pay anything for the program. The students learn in the classroom from certified flight instructors about aerodynamics and rules and regulations. Major went through the program in 2013. He trained in a 2-seater, L-600 aircraft. The light sport aircraft have a gross weight of 1,380 pounds. He is currently the assistant program coordinator for the program. Major said aviation is unique because of the unconstrained mobility. Able Flight is a non-profit organization. Full scholarships cover flight and ground training, study materials, testing fees and lodging. At the end of seven weeks, graduates of the program earn their sport pilot certificate. Major completed the course when he was 23. He went on to earn a master’s degree in aviation and is currently working on his Ph.D. in aviation and aerospace management. He is a graduate research assistant and anticipates earning his doctorate in December. This summer, he’ll be completing an internship with the Federal Aviation Administration. He hopes that will lead to a future position with the agency. “Wesley epitomizes what Able Flight is all about,” said Boca Grande resident Jerry Rainey, Wesley’s uncle. Major is from Wilmington, Delaware. His parents, Bernadette and Wesley, and his younger brother, Jordan, currently live in Delaware. Able Flight™ is incorporated as a 501(c)3 nonprofit organization, and is supported by the generous donations and sponsorships of individuals, foundations and corporations. 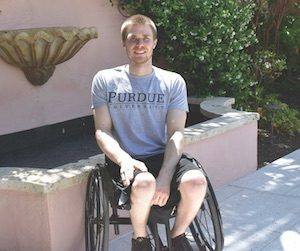 This is the ninth consecutive year of Able Flight’s partnership with Purdue, and its second year working with The Ohio State University. Graduates of the “Class of 2018” will be guests of honor when they receive their Able Flight Wings on stage at EAA AirVenture On Tuesday, July 24, just weeks after becoming licensed pilots. For more information, visit ableflight.org.